Raise your hand if you have a little one that is crazy over Ninja Turtles. Same here. I think it’s so awesome that my kids love something that I loved as a kid. I dressed up as a Ninja Turtle when I was little and my son dressed up as one, too! How cool is that? In honor of the new TMNT movie coming out on DVD last month I thought I’d share some fun turtle crafts. Santa was nice enough to bring Brady the new movie on Christmas morning. 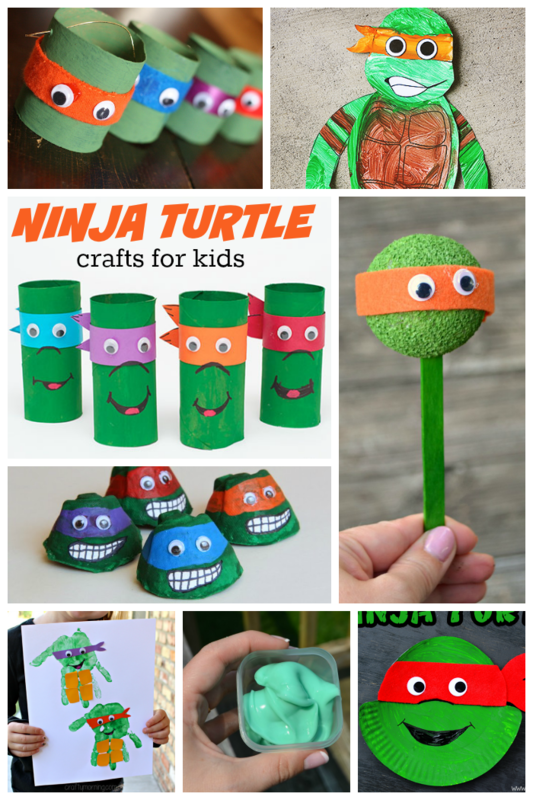 Thanks for adding my TMNT craft to this awesome roundup!! Love these crafts, such a hit with the boys for sure. By the way your site is super cute, loving all these cupcake liner crafts you did. Especially that crab and Ninjafo. I will be adding those to my craft to do list. I’ll make sure to stop by and follow you as well. Have a great New Years!! Thank you so much for featuring my Turtle Puppets and Sewer Slime! Thank you so much for featuring my Ninja Turtle treat bags in this round-up! Go TMNT!